Abolitionist image sold as a carte-de-visite in the 1860s showing a shirtless man, seated sideways in his chair, with his back to the camera, his left hand on his hip with elbow out to the side, his face in profile; a spidery network of thick knotty scar tissue covers his back; a short printed account of his ordeal in his own words is pasted onto the back of the card; stamped beneath by A.I. 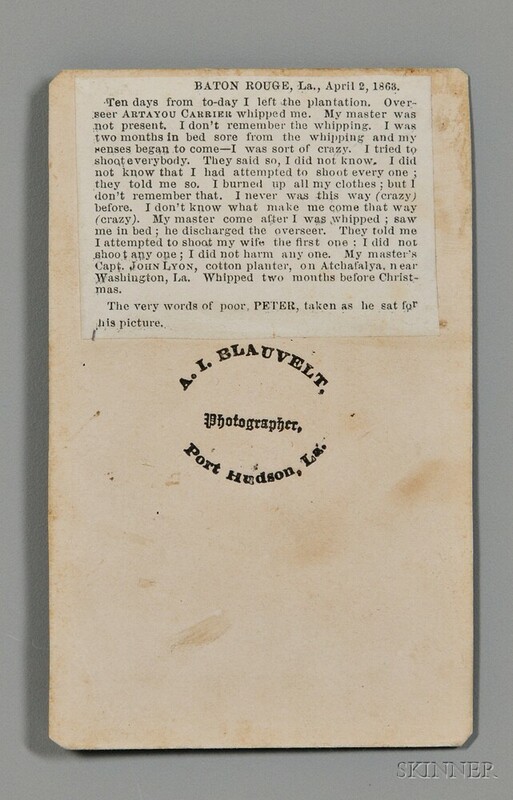 Blauvelt, Photographer, Port Hudson, Louisiana; very small spot of marginal damage along top edge, 4 x 2 1/4 in. "Baton Rouge, LA, April 2, 1863. Ten days from to-day I left the plantation. Overseer Artayou Carrier whipped me. My master was not present. I don't remember the whipping. I was two months in bed sore from the whipping and my senses began to come--I was sort of crazy. [...] My master's Capt. John Lyon, cotton planter, on Atchafalya, near Washington, Louisiana. Whipped two months before Christmas."